The first Oyster 100 superyacht, launched in June 2011, is now named Sarafin and has successfully completed her sea trials ahead of handover to her owners in October. Sarafin was built in collaboration with the Turkish yard RMK Yachts. Designed by Dubois Naval Architects and Oyster Marine, she has a length of 30.80m and an all-composite construction, making her far lighter than her rivals. She is designed with the specification, features and classification of a much larger yacht. The standard accommodation layout offers three cabins aft and two crew cabins forward. A raised saloon offers a panoramic view and leads forward and down to a more intimate lounge and separate dining area. Forward of the main living area is the crew mess, galley and two crew cabins. A six-cabin variant is also available, offering a fourth double guest cabin forward, in addition to the two crew cabins. Sarafin will spend some time in Palma, Mallorca before heading for a winter season in the Caribbean. 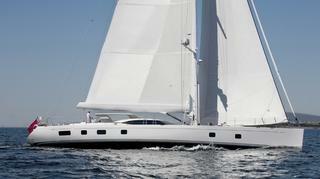 She is expected to take part in the St Barth's Bucket Regatta in March 2012.